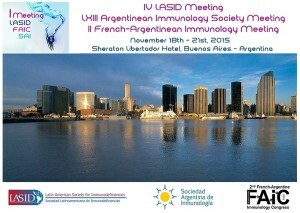 IPOPI is looking forward to its upcoming Latin American Regional Patient Meeting during the Latin American Society for Immunodeficiencies (LASID) Congress, on 18 and 19 November 2015 in Buenos Aires (Argentina). The agenda for this meeting consists of interactive workshops on several key topics for the region including on patient organisations’ sustainability and fundraising; the implementation of the PID Principles of Care in the region. The programme will allow for plenty of opportunities for the participants to intervene and discuss the challenges and opportunities they are currently facing in their respective countries, as well as identify regional priorities and agree on strategic actions aimed at improving access to diagnosis and care. In addition, educational lectures from medical doctors and nurses will also be on the menu including on newborn screening for Severe Combined Immunodeficiencies and on subcutaneous immunoglobulins. The LASID Congress is the most important scientific and medical biennial event on primary immunodeficiencies taking place in Central and South America. IPOPI is looking forward to attending the lectures and sessions where the latest findings on research and clinical practice on PIDs will be presented! The meeting is supported through an unrestricted grant from CSL Behring.